2011 is coming! 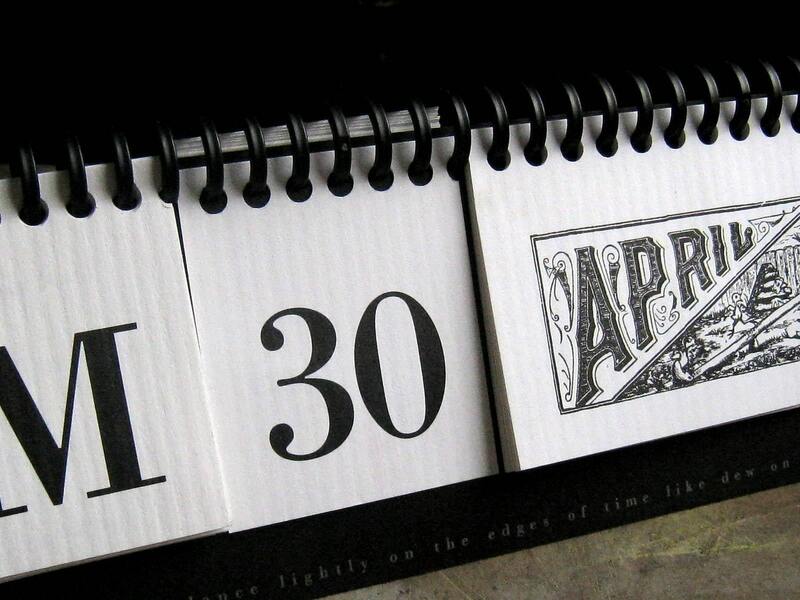 To keep track of our ever-dwindling days, why don’t we invest in some calendars? I’ve got some top-notch calendar picks for you here… if you can call all of them calendars. Are some of these more poster-like than calendar-like? Probably. Buuuuuut, your grandmother’s stereotypical calendar just isn’t that cool these days, so why not spruce your living spaces up and get some calendars which actually make some design statements?… I guess. I mean, personally, I’m not super sold on the idea of using calendars that don’t actually allow me to write in scheduling details, but I digress. Let’s just admit that these calendars are mostly for aesthetic qualities and minorly for functional ones, and get on with it! Let’s buy some cool-looking prints and paltry delights! 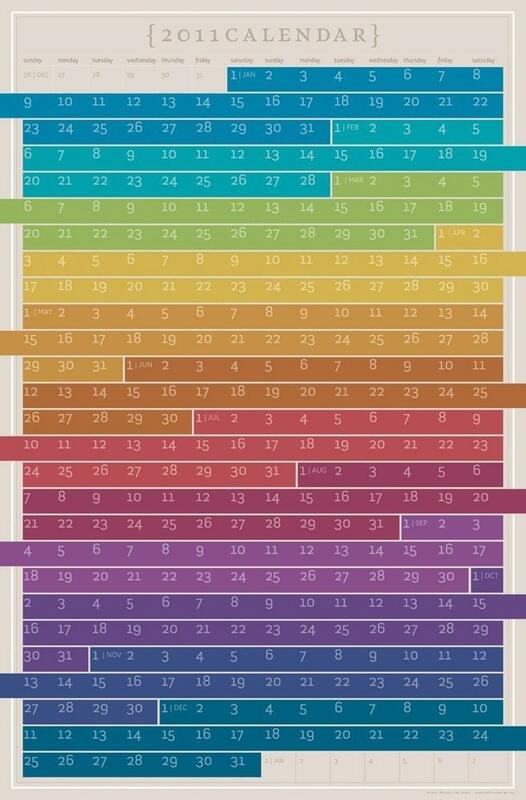 It’s like a periodic table, only it’s not. And it’s huge. And you can actually write on it. Well, alright, then. 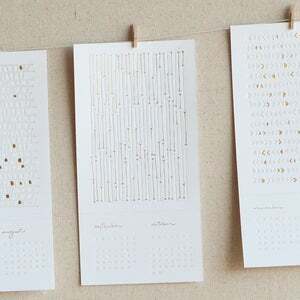 At 5″ x 10″, these calendar sheets have a nice format that really makes the letterpressed line and shape patterns on them POP! Throw them side-by-side for a line of lovely hand-drawn geometrical works! This series, with two images for each month (front and back), cycles between housewife-friendly letterpressed images and psychedelic geometric ones. I dig it. 12 colorful pages, printed front and back, with jewel case stand included. Printed in Portland, Oregon, on recycled content paper with soy-based inks. This needs no explanation. It’s just kind of cool. Oh snap, these are cool, and for any animal lover! Patterns one month, animals the next! There are only LESS THAN A HANDFUL of these left, so get ON it. Lovely packaging, too. 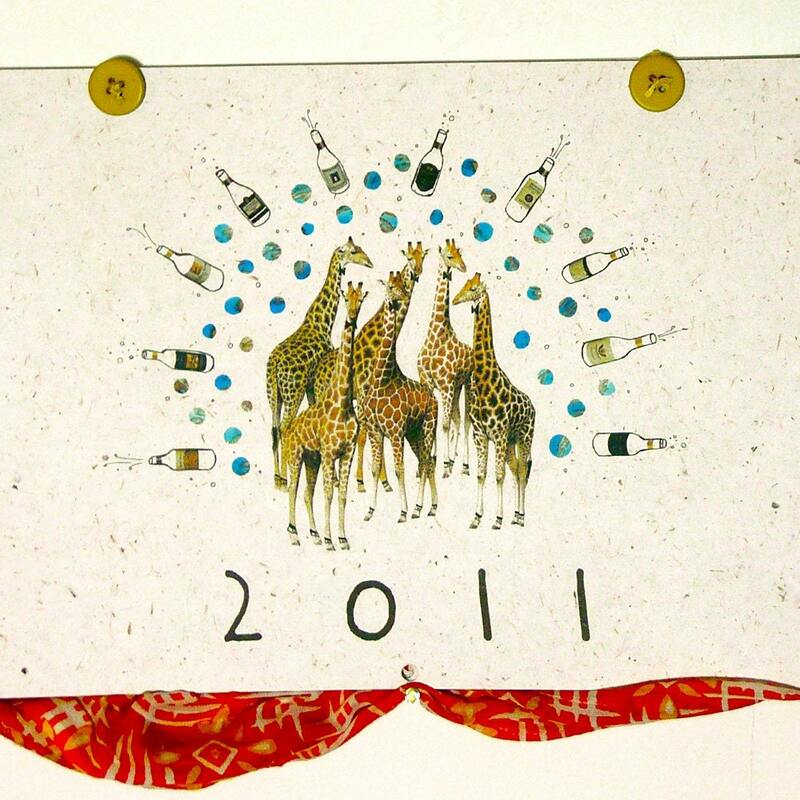 This is my 12 month calendar for 2011. The calendar is 4.25″ x 11″ and professionally printed on Mohawk off-white textured paper. Each month has a different image and once the month is over you can trim off the calendar to frame the drawings or send them as a note! There’s a small space at the bottom to write important notes for the month and a hole punch at the top so you can easily pin them up. The calendar is then wrapped with a kraft paper cover and tied with twine, making it a great gift. Each calendar will be shipped with cardboard backing in a cello sleeve to ensure it makes it to you unscathed. Hand-screened and gorgeous! This, to me, is a calendar that was made simply for the love of it. Look, how affordable! 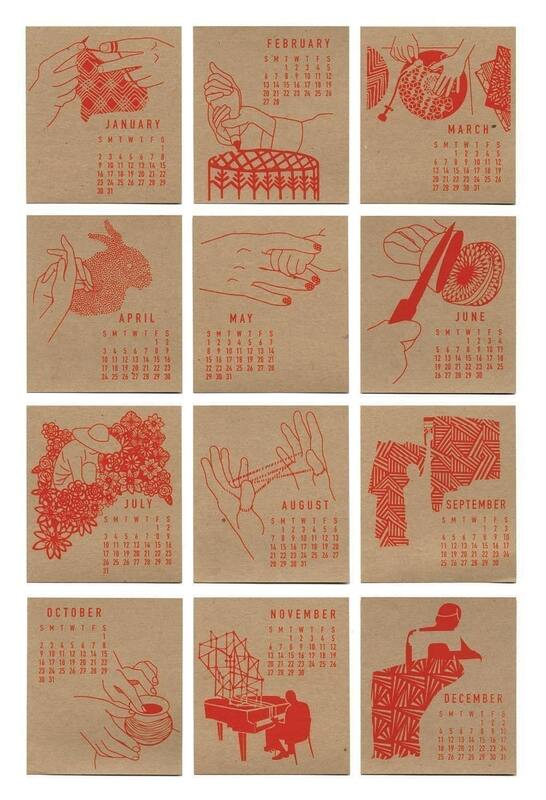 This calendar is a celebration of using your hands creatively! Each of my hand printed illustrations show a person making/doing with their hands, something I find very rewarding. In fact, I’m usually the happiest when I’m using my hands. Thats why I felt it was important to make this calendar. The process of screen printing lets the ink sit above of the paper giving the finished product a much more tactile feel. Each calendar is lovingly silk screened at The Pull, an independent silk screen shop in Portland, Or operated by Diskgrunt. I reduced environmental impact by printing on both sides of the paper. So you will receive six two-sided prints measuring 4.6in x 5.25 to make 12 months. I hope you enjoy! Lovers of wonderful color palettes rejoice! 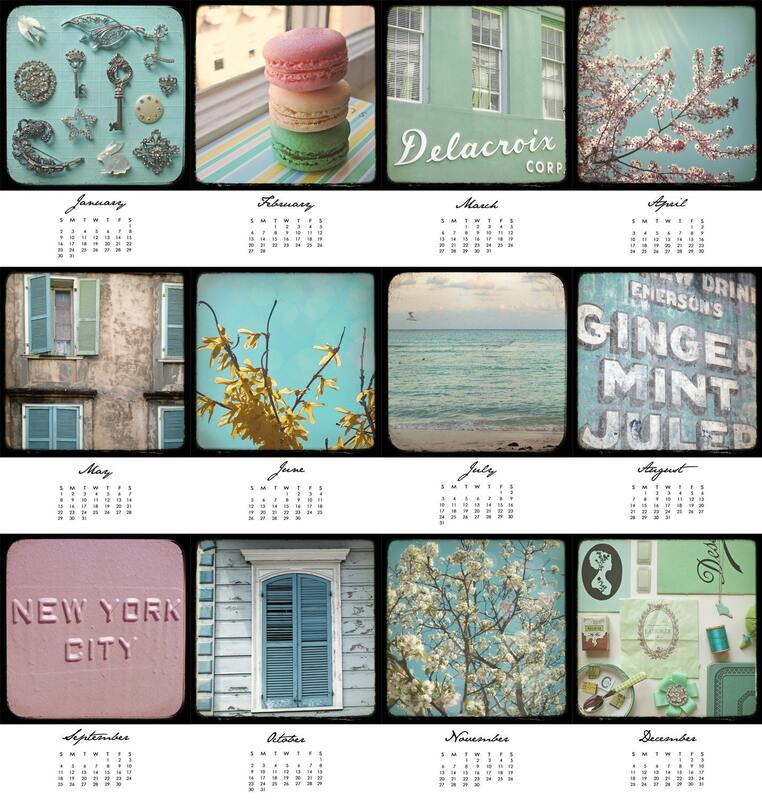 for the lover of all things dreamy and pastel, this 2011 mini photo calendar is the perfect gift! i have selected some of my absolute favorite images to make up this lovely calendar. the calendar is made up of 13 loose pages (12 months + cover), featuring high quality images printed on card stock. display each month on your cork board, fridge, or wherever else you like! you could even use a 5×7 frame to create a rotating display each month. 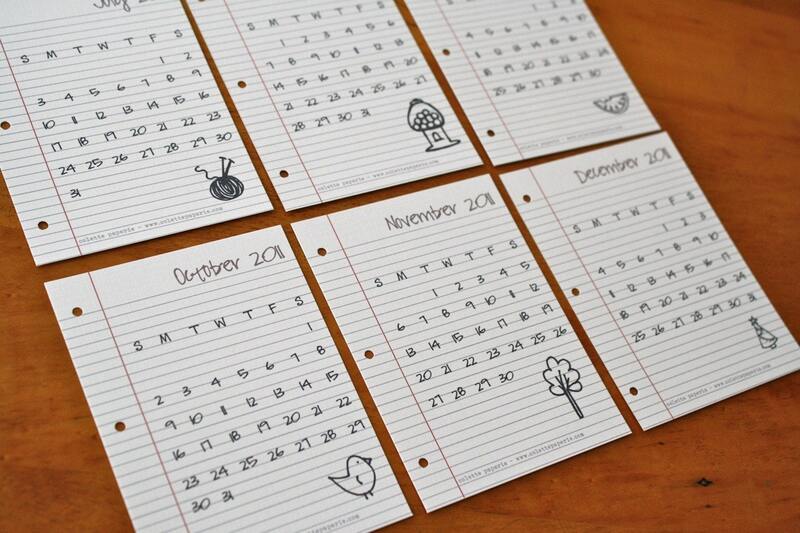 when you are finished using the calendar, you can trim each page down to a beautiful 5×5 photo suitable for framing. my 5×5 photo prints normally cost $10 each, so you are getting a great deal when you purchase the calendar! If my memory serves me correctly, Pawling Print Studio has won my heart a couple times with their simple illustrated notebooks. Well, I like these even better. Easy, classy, Escher-y. Oh my god, is this a real calendar? It sure is. Buuuuuut, with FLAIR! Tied together, multi-lingual, graphically-engaging, eco-friendly? Jeebus. Each month is in a different language and features a print of my mixed media collage and ink drawing. Every collage was hand-made then drawn on with ink and scanned for digital printing. 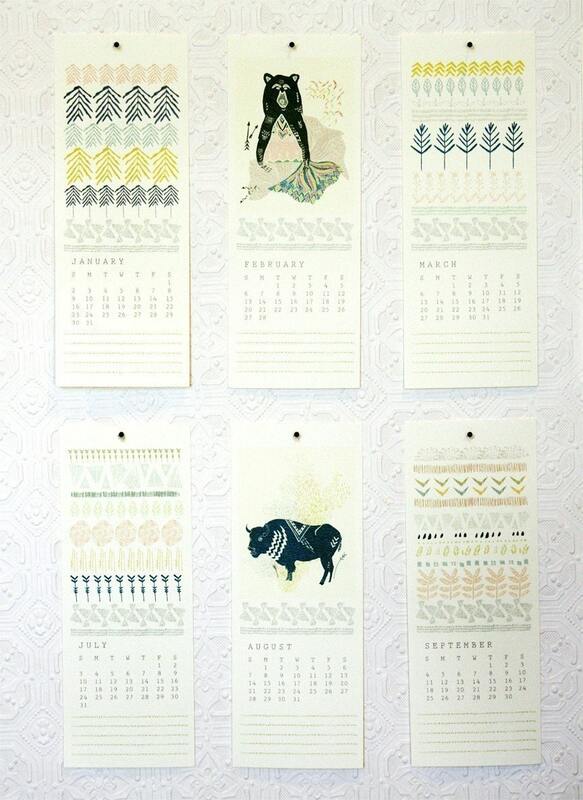 The entire calendar is quirky, endearing, and playful, and oh-so-eco friendly and international to keep you looking cool. I’m really excited to be releasing this calendar because of all the new artwork you’ll find within. If you’re familiar with past editions, I’m still printing on 100% tree-free banana paper, and every month features United Nations international holidays that are wonderful in their intention because they know no national boundaries! And last, but not least, my personal favorite! It’s reusable, inspirational, and so very sleek!